Some of you might be unaware of the fact that there’s still an Amiga magazine being published every second month. The name of the publication is Amiga Future and it covers everything related to the Amiga. According to the Amiga History Guide, the first issue of Amiga Future was created back in June 1998 by APC & TPC, a former Amiga user group that had turned into a software publisher. The publisher was a company called ICP Verlag, well-known for the German Amiga Plus magazine. Since then, a grand total of 94 issues of Amiga Future have been published to date. 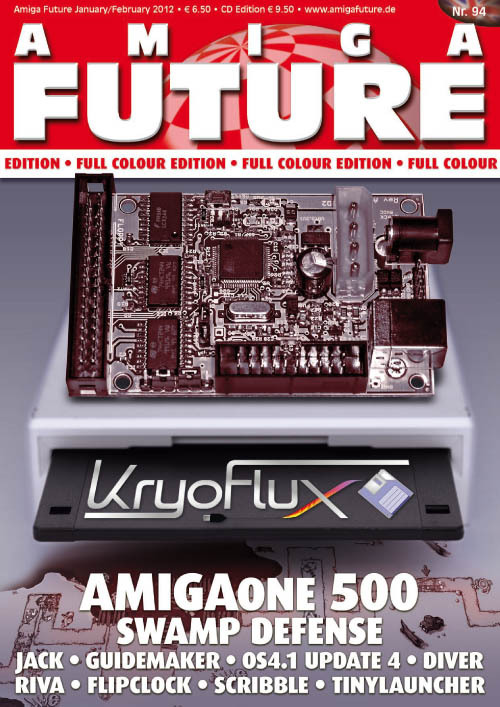 The 94th issue of Amiga Future was released today. The big news this time is that the whole magazine is finally in colour. 🙂 I’m going to place an order after I’ve finished writing this post, as I’m really looking forward to see how it looks. I’ve only read Amiga Future in black and white in the past, so it will be great to explore the new version. You can purchase issue 94 from dealers like AmigaKit and Vesalia or place an order directly on the website (click on the “Shop”-button in the menu) of Amiga Future. Next Amigaworld.net and A-EON Technology Hacked! Have now ordered issue 94 of Amiga Future. 😀 Can’t wait! Cool! I am always thinking about subscribing. I really should. How much you paid for this issue? It costed 9.50 EUR, but 0.65 EUR was deducted from the price (German VAT). Total price was therefore 8.88 EUR. That’s a fair price. Hmmm tempting. is that including shipping? I haven’t had a magazine subscription for anything since ’96. That’s a long time without a subscription. What did you subscribe to back then?